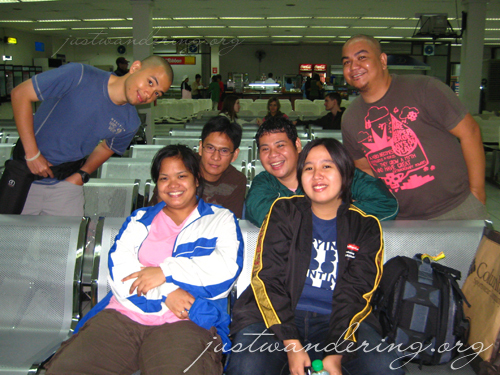 The flight out of Manila was scheduled for 5:50am. I still had work Friday night, so I was hurriedly finishing work-related things online. To my surprise, most of my travel buddies are also online on Plurk, which of course, made it hard for me to concentrate on my writing! Flying at 5:50 am, meant having to be at the airport before 4:50am, which in turn meant leaving the house at 3am. Rather than to sleep and risk oversleeping and missing the flight, Eric, Gail and Melo opted to pull an all nighter. What I love about early morning flights is the traffic-less EDSA. Living in the north, travel time to the airport during rush hour can be terribly time consuming — it can take from one to two hours to get from my house in Quezon City to one of the airports in Parañaque City. Before the traffic starts, travel time can be cut to almost 30 minutes. Using the old domestic terminal can usually be an ordeal: it’s too small, too cramped and too many people are using it. Thanks to the opening of the new NAIA Terminal 3, the number of passengers using the old domestic terminal has significantly gone down. Now, only two commercial airlines use the old terminal, one of which is Seair. The pre-departure lounge was almost empty — a world of difference from the last time we used the terminal last June, when it was packed to the seams. We sat down, chatting amongst ourselves to pass the time while waiting for the flight to be called. The clock ticked past 5:50 am, and still no call. Soon enough, there was an announcement: flight DG601 bound for Basco was delayed. We were dismayed, but the announcement didn’t really come as a shock; for days we’ve been monitoring the weather in Batanes, and it was anything but sunny. 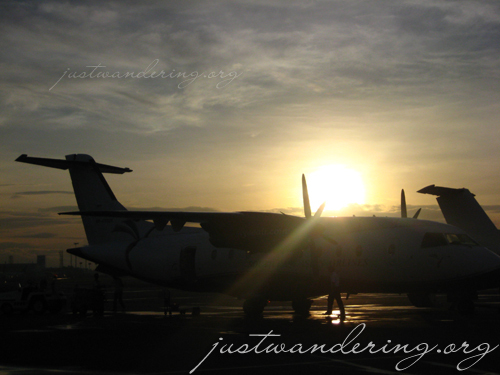 We thought of possible places we can go instead, if flying to Basco wasn’t feasible. Melo wasn’t hearing any of it, and went to inquire among the ground staff. It seems the flight was only delayed because the airport office in Basco only opens at 6 o’clock in the morning. The people in Manila have to confer with its Basco counterparts before allowing the plane to fly. Soon enough Seair flight DG601 was called — but for Boracay! It was an honest mistake on the part of the announcer, but it was indeed for the flight to Basco, Batanes. Within minutes we were onboard the Dornier 328 plane. It was my first time to fly north, and it was interesting to see how different the view from the plane was from all the flights I’ve taken going south. After reading through two Inflight magazines, the fasten seatbelt sign flashed — we are on the final descent to Basco. I eagerly looked out the window to see mountainous islands, the green stretching as far as the eye can see. I can see small roads hugging the sides of the mountain, small communities, and even smaller patches of beaches. We’re in Batanes! 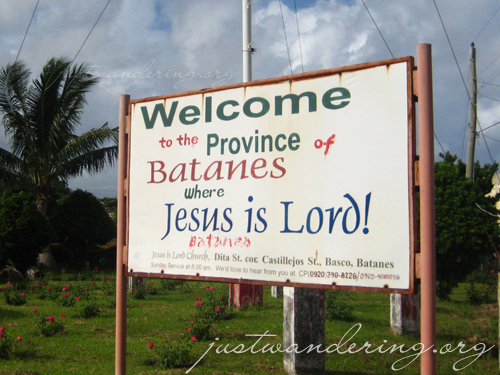 Welcome to Batanes, where Jesus is Lord! A huge thanks goes out Seair, who provided our transport to Batanes. A shout out also goes out for Mr. Patrick, Seair’s VP for Marketing, and his assistant, Leo for making this possible. Thanks guys! Dont worry, God Bless you,. Mama Mary Loves you. “airport office in Basco only opens at 6 o’clock in the morning. The people in Manila have to confer with its Basco counterparts before allowing the plane to fly.” – so it means lahat ng flight ma delayed? the other airline even had a much earlier flight schedule. …no, they got it wrong—it’s where BABY Jesus is Lord!!! LOL. …must go to Batanes. Dude, the video was awesome! I have always dreamt of going to Batanes but that P5000+ is still not cheap for me. ANy other alternative of going there at a cheaper rate?